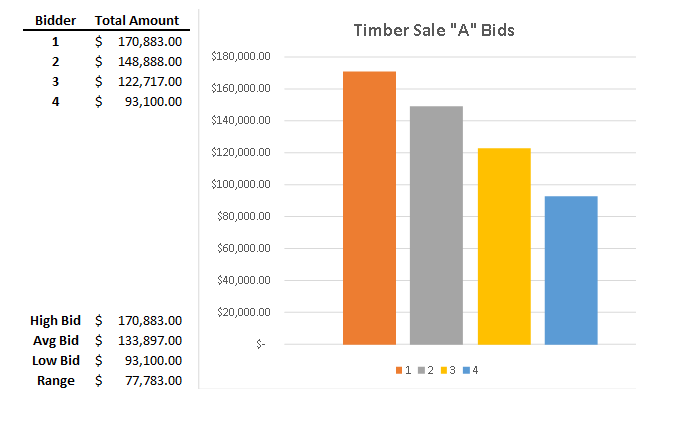 Though very recent news is saying that hardwood markets are throttling back a little, we have seen continued success for our clients using the competitive bid sale process to sell their timber. Below are several more recent sales we’ve administered. 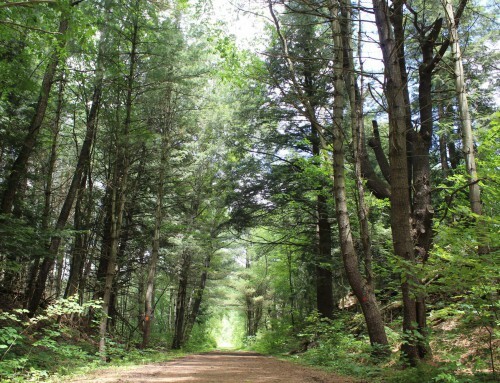 A recent timber sale (“Timber Sale A”) in central New York shows how wide a bidding range can be, even with relatively few bidders, indicating once again how well competitively-bid timber sales can benefit the landowner. FORECON cruised and marked a timber sale that contained approximately 188,000 board feet (Doyle Log Rule), with a mixture of white ash, hard maple, soft maple, black cherry, red oak, and a variety of lesser valued species. The white ash averaged about 112 board feet/tree, the hard maple about 156 bf/t, the soft maple about 153 bf/t, the black cherry about 176 bf/t, and the red oak about 186 bf/t. A bid prospectus containing a list of the number of trees and volumes by species, along with terms of the sale and sale maps, was mailed out to prospective bidders. Even though we had relatively few bidders participate in this sale, the bid results were excellent. The high bid was 84% higher than the low bid, with 2 bids below the average and 2 above. 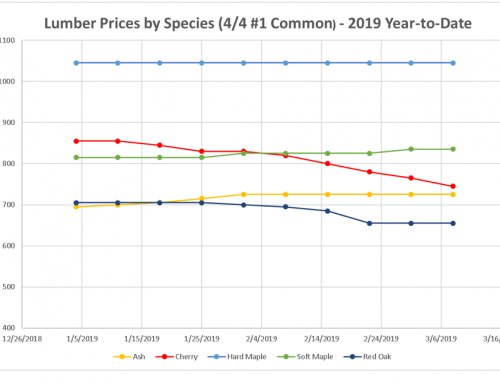 It was estimated that the white ash brought over $758/Mbf (Doyle); hard maple came in at about $1,348/Mbf; soft maple at about $421/Mbf; black cherry at about $1,517/Mbf; and red oak at about $1,095/Mbf. 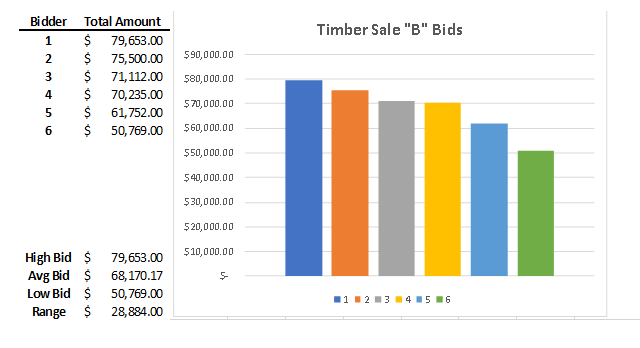 Here’s another recent timber sale (“Timber Sale B”) in southwestern NY that also sold very well under the competitive bid format. 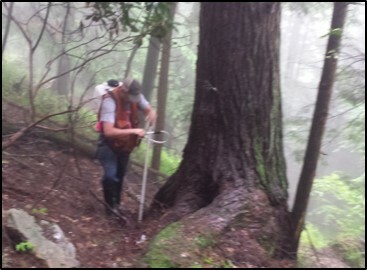 We cruised and marked this timber sale, and it contained about 108,200 board feet (Doyle Log Rule). There was a mixture of white ash (160 bf/t), black cherry (276 bf/t), soft maple (248 bf/t), hard maple (229 bf/t), red oak (421 bf/t), and a variety of other miscellaneous species. A bid prospectus containing a list of the number of trees and volumes by species, along with terms of the sale and sale maps, was also mailed out to prospective bidders. The bid participation in this sale was a little stronger, and the high bid was 57% higher than the lowest bid, with 4 bids above the average, and 2 bids below. It was estimated that the white ash brought about $613/Mbf (Doyle); black cherry about $1,226/Mbf; soft maple about $490/Mbf; hard maple about $736/Mbf; and red oak also about $736/Mbf. 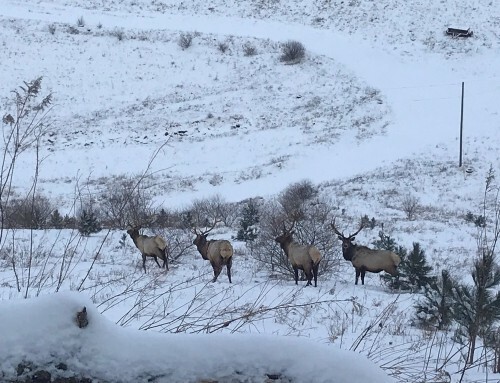 Please keep in mind that results depend on a variety of circumstances; species of timber, quality of timber, access conditions, and prospectus terms are just some of them. The timber markets in our region remain very active, and we will continue to bring more insight into bidding results in subsequent posts. As always, if you have timber you may be interested in selling, and want a long-standing professional forestry firm representing your best interests in the process, please don’t hesitate to call any of our FORECON offices. Our foresters would be very happy to speak with you about the markets, and more importantly, your goals and objectives for your land.